Selling vegetables you've grown and harvested is a way to make extra money. The biggest drawback to growing and selling vegetables is the amount of labor and initial cost. Also, a vegetable farmer works in all weather conditions and there's always something to do every day. However, watching customers appreciate and buy homegrown produce can be rewarding. 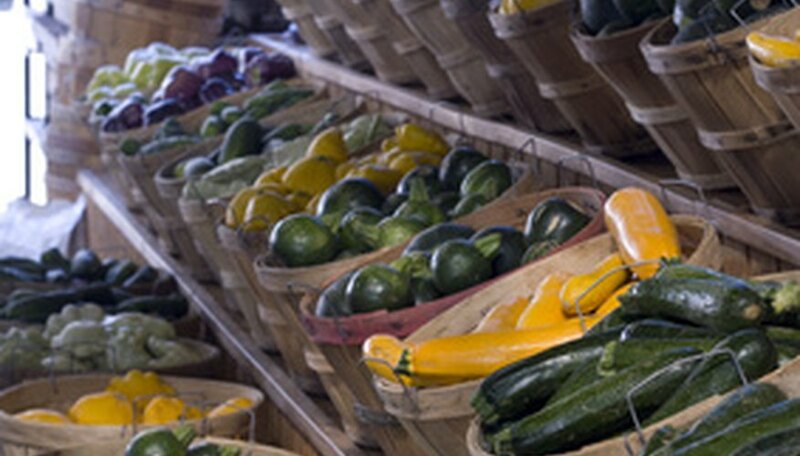 Buying locally grown produce supports local farmers and communities. Find a location and obtain any licenses required to sell agricultural products in your state. It is much easier to have a marketing plan in place before you begin growing your vegetables, rather than trying to sell them after they are harvested. Some options are roadside sales in a high-traffic area, farmers markets or selling to restaurants or grocery stores. Each place where you plan to sell your product will have some state or federal regulation and licensing involved. The best way to find out what licenses are needed is by contacting your local U.S. Department of Agriculture office. Designate an area to grow your crops. Keep in mind the spacing requirements for all plants. The growing area should be near a water source, because vegetable plants require supplemental moisture. The planting area should receive at least six hours of direct sunlight each day during the growing season. Take a soil test to find out what nutrients need to be added to the soil for optimal growing conditions. The best way to get an accurate soil test is by contacting your local county agricultural extension office. Prepare ground by clearing the area of weeds and adding amendments required by the soil test. Plants grow best if the soil is pulverized to a depth of about 12 inches with a hoe or shovel. Weeds, which compete for moisture and nutrients, need to be removed often during the growing season. After working in the amendments into the top 2 to 3 inches of soil with a hoe, rake the area smooth. Plant vegetable plants at recommended intervals and proper time of year. Install irrigation equipment. Irrigation methods used in vegetable gardening include overhead watering and drip irrigation. where water runs through a plastic tape with tiny holes in it or a porous rubber hose. Harvest high-quality vegetables at the proper time. Locally grown vegetables are expected to look better than vegetables found in grocery stores. Harvest in early morning when the sugar and moisture content is highest in each vegetable. Store freshly harvested vegetables properly before market. You will need a cooler to store the vegetables that need refrigeration. Bring the vegetables to market in a covered delivery vehicle. Display vegetables in an attractive way when you bring them to market.